Live on the mid-U.S. Eastern Seaboard? Wanna see a rocket launch? We’ve go one for you, coming live from NASA’s Wallops flight facility tonight. We’ve actually been chasing this one for about a week now and conditions need to be just right for it to happen. We’re talking about a sub-orbital flight of a Terrier-improved Malamute rocket. The mission is a short up and down flight, meant to test new ampoule dispensers aboard. This will shoot out chemical tracers high in the Earth’s tenuous upper atmosphere, creating a brief false aurora for researchers to track the movements of air currents high up. Thus far, the launch has been thwarted by wayward boats in the hazard area and pesky summer clouds. 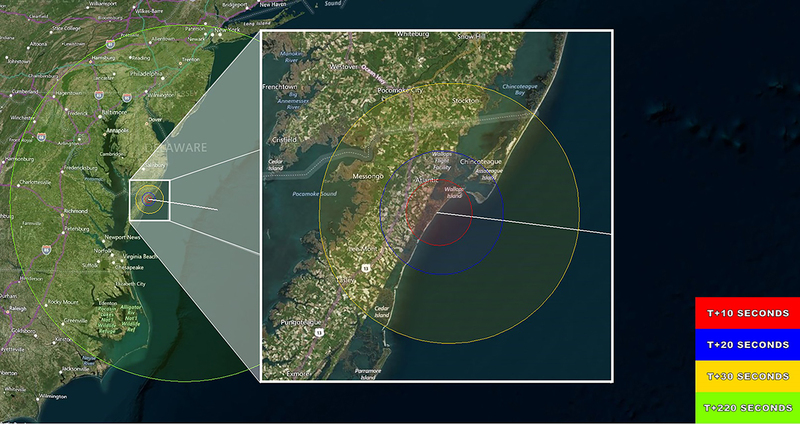 Researchers need clear skies for this one to track the light show from the ground, both from Wallops and a satellite site known as “Duck”. With a little luck, folks from North Carolina up to southern New York might just catch the light show as well, low to the east. Here’s the visibility map. Unlike large rockets, little two-stage sounding rockets are real “fast movers” and fun to watch. The nightly launch window runs out on Sunday, June 18th. We’ll be live tweeting this one as well. Here’s hoping for clear skies! But wait, there’s more. Don’t miss the SpaceX launch of BulgariaSat-1 from the Kennedy Space Center Saturday night June 17th at 18:10 UT/2:10 PM EDT. And we’re also tracking the rumored launch of China’s first X-Ray Space Telescope the HXMT as well. Stay tuned!